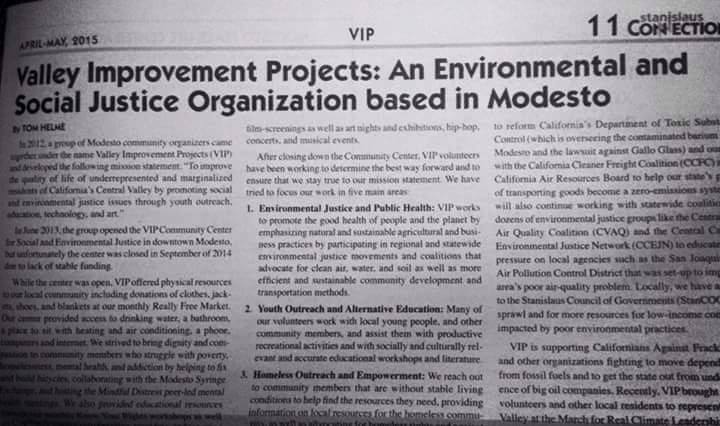 Valley Improvement Projects was recently featured in Stanislaus Connections, the semi-monthly publication of the Modesto Peace/Life Center. Check out http://peacelifecenter.org/ for more information about the Peace/Life Center in downtown Modesto. In June 2013, the group opened the VIP Community Center for Social and Environmental Justice in downtown Modesto, but unfortunately the center was closed in September of 2014 due to lack of stable funding. While the center was open, VIP offered physical resources to our local community including donations of clothes, jackets, shoes, and blankets at our monthly Really Free Market. Our center provided access to drinking water, a bathroom, a place to sit with heating and air conditioning, a phone, computers and internet. We strived to bring dignity and compassion to community members who struggle with poverty, homelessness, mental health, and addiction by helping to fix and build bicycles, collaborating with the Modesto Syringe Exchange, and hosting the Mindful Distress peer-led mental health meetings. We also provided educational resources through our monthly Know Your Rights workshops as well as CopWatch trainings on observing, recording, and reporting interactions with police. We acted in solidarity with tenants and assisted them in their struggles with unfair landlords through direct actions and community engagement. As a collaboration of community members we hosted dinners and film-screenings as well as art nights and exhibitions, hip-hop, concerts, and musical events. 1 – Environmental Justice and Public Health: VIP works to promote the good health of people and the planet by emphasizing natural and sustainable agricultural and business practices by participating in regional and statewide environmental justice movements and coalitions that advocate for clean air, water, and soil as well as more efficient and sustainable community development and transportation methods. 2 – Youth Outreach and Alternative Education: Many of our volunteers work with local young people, and other community members, and assist them with productive recreational activities and with socially and culturally relevant and accurate educational workshops and literature. 3 – Homeless Outreach and Empowerment: We reach out to community members that are without stable living conditions to help find the resources they need, providing information on local resources for the homeless community, as well as advocating for homeless rights and against anti-homeless ordinances and laws that criminalize instead of humanize. 4 – Tenant/Worker Rights and Solidarity: VIP assists local residents being harassed or treated unfairly by their landlords or employers and works toward building solidarity amongst them in order to take the actions needed to receive fair treatment, compensation, and justice. 5 – Law Enforcement/Prison/Immigration Accountability: VIP works to ensure police, immigration, prison, and jail officials and institutions are held accountable for their actions in cases of abuse and participate in events, demonstrations, and meetings with state-wide and regional coalitions against police/prison/immigration abuse and for accountability. At our first meeting of 2015, fifteen local citizens got together at a local bowling alley to discuss the projects that VIP will be involved with for the next few years. The meeting consisted of founding members of VIP as well as a host of new members joining for the first time. The diversity of voices in that meeting, ranging from students, church leaders, and educators, cultivated a wide range of opportunities for VIP. The variety of topics and issues included the need for resources and drop-in centers for local youth with mental health issues in Modesto and Turlock. Drawing inspiration from actions in Ferguson, New York, and other places around the country, some volunteers expressed interest in organizing around issues of police brutality, accountability, racial profiling, and incarceration. VIP is continuing to work with the California Environmental Justice Coalition (CEJC) to reform California’s Department of Toxic Substances Control (which is overseeing the contaminated barium site in Modesto and the lawsuit against Gallo Glass) and our work with the California Cleaner Freight Coalition (CCFC) and the California Air Resources Board to help our state’s process of transporting goods become a zero-emissions system. We will also continue working with statewide coalitions and dozens of environmental justice groups like the Central Valley Air Quality Coalition (CVAQ) and the Central California Environmental Justice Network (CCEJN) to educate and put pressure on local agencies such as the San Joaquin Valley Air Pollution Control District that was set-up to improve the area’s poor air-quality problem. Locally, we have advocated to the Stanislaus Council of Governments (StanCOG) for less sprawl and for more resources for low-income communities impacted by poor environmental practices. VIP is supporting Californians Against Fracking (CAF) and other organizations fighting to move dependence away from fossil fuels and to get the state out from under the influence of big oil companies. Recently, VIP brought some of our volunteers and other local residents to represent the Central Valley at the March for Real Climate Leadership, the largest ever anti-fracking demonstration in the country. Over 8,000 people marched in both rain and sunshine in Oakland on February 7th to demand that Jerry Brown institute a statewide ban on fracking. In the last couple of weeks, we have been meeting and corresponding with city officials on possible ways to improve the city’s annual Earth Day Festival, which VIP members have long criticized for its lack of integrity and its inconsistency with a just climate and environment. One of the main critiques we have presented is that two of the event’s main sponsors are Boyett Petroleum, an oil company, and Covanta, a trash incinerator that pollutes the air in west Stanislaus County. VIP is looking to reach out to any local organizations, groups, or individuals that share these common interests and goals. If you are interested in getting involved with VIP, please contact us through any of the ways listed below. 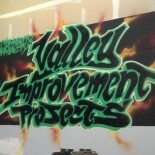 This entry was posted on April 1, 2015 by valleyimprovementprojects in Environmental Justice, Social Justice and tagged modesto peace/life center, stanislaus connections.